Location of Cicero in Cook County, Illinois. Cicero (originally known as Hawthorne) is a suburb of Chicago and an incorporated town in Cook County, Illinois, United States. The population was 83,891 at the 2010 census. As of 2013, the town had a total population of 84,103, making it the 11th largest municipality in Illinois. The town of Cicero is named after Marcus Tullius Cicero, the Roman statesman and orator. Originally, Cicero Township occupied six times its current territory. Weak political leadership and town services resulted in cities such as Oak Park and Berwyn voting to split off from Cicero, and other portions such as Austin were annexed into the city of Chicago. By 1911, an aerodrome called the Cicero Flying Field had been established as the town's first aircraft facility of any type, located on a roughly square plot of land about 800 meters (1/2-mile) per side, on then-open ground at 41°51′19.03″N 87°44′56.5″W﻿ / ﻿41.8552861°N 87.749028°W﻿ / 41.8552861; -87.749028 by the Aero Club of Illinois, founded on February 10, 1910. Famous pilots like Hans-Joachim Buddecke, Lincoln Beachey, Chance M. Vought and others flew from there at various times during the "pioneer era" of aviation in the United States shortly before the nation's involvement in World War I, before the field closed in mid-April 1916. Al Capone built his criminal empire in Chicago before moving to Cicero to escape the reach of Chicago police. Cicero was taken up and abandoned several times as site for a civil rights march in the mid-1960s. Cicero had a sundown town policy prohibiting African Americans from living in the city. The American Friends Service Committee, Martin Luther King, Jr., and many affiliated organizations, including churches, were conducting marches against housing and school de facto segregation and inequality in Chicago and several suburbs, but the leaders feared too violent a response in Chicago Lawn and Cicero. Eventually, a substantial march (met by catcalls, flying bottles and bricks) was conducted in Chicago Lawn, but only a splinter group, led by Jesse Jackson, marched in Cicero. The marches in the Chicago suburbs helped galvanize support for the passage of the Civil Rights Act of 1968 in 1968, extending federal prohibitions against discrimination to private housing. The act also created the United States Department of Housing and Urban Development's Office of Fair Housing and Equal Opportunity, which enforces the law. The 1980s and 1990s saw a heavy influx of Hispanic (mostly Mexican and Central American) residents to Cicero. Once considered mainly a Czech or Bohemian town, most of the European-style restaurants and shops on 22nd Street (now Cermak Road) have been replaced by Spanish-titled businesses. In addition, Cicero has a small black community. Cicero has seen a revival in its commercial sector, with many new mini-malls and large retail stores. New condominiums are also being built in the city. According to the 2010 census, Cicero has a total area of 5.86 square miles (15.18 km2), all land. Cicero formerly ran from Harlem Avenue to Western Avenue and Pershing Road to North Avenue; however, much of this area was annexed by Chicago. St. Mary of Czestochowa, a Neo-Gothic church built in the Polish Cathedral style along with the sculpture of Christ the King by famed sculptor Professor Czesław Dźwigaj, who also cast the monumental bronze doors at St. Hyacinth's Basilica in Chicago. The church's other claim to fame is as the site of Al Capone's sister Mafalda's wedding in 1930. J. Sterling Morton High School, East Campus, also known as Morton East High School, was built in 1894. The original school was destroyed by fire in 1924, and the current building was constructed. Located at 2423 S. Austin Blvd, Morton East serves residents of Cicero. Chodl Auditorium, located inside Morton East High School, was built in 1924 (completed 1927) to replace the 1,200-seat auditorium which was destroyed by fire. The auditorium was originally a dual-purpose room, serving as a gymnasium for students, and was originally built for this purpose. In 1967 the school stopped using the auditorium as a gymnasium. Chodl Auditorium is among the largest non-commercial proscenium theatres in the Chicago Metropolitan Area and is listed with the National Register of Historic Places. Hawthorne Works Tower, one of the original towers of the enormous Western Electric manufacturing plant that once stood east of Cicero Avenue, is still located behind the Hawthorne Works Shopping Center near the corner of Cermak Road (22nd Street) and Cicero Avenue. Chicagoland Sports Hall of Fame. On the south side of Cicero, there were two racetracks. Hawthorne Race Course, located in Cicero and Stickney, is a horse racing track still in operation. Just north of it was Chicago Motor Speedway at Sportsman's Park, which was formerly Sportsman's Park Racetrack (for horse racing) for many years. This Sportsman's Park facility is now closed, acquired by the Town of Cicero, and has since been demolished. Facilities of the Wirtz Beverage Group have been built on the west half and a Walmart built on the east half. As of the 2010 census, 83,891 people, 22,101 households, and 17,752 families resided in the town. The population density was 14,315.9 people per square mile (5,527.4/km²). There were 24,329 housing units at an average density of 4,151.7 per square mile (1,600.6/km²). The racial makeup of the town was 51.9% White (9.2% Non-Hispanic white), 3.8% African American, 0.8% Native American, 0.6% Asian, 0.1% Pacific Islander American, 39.3% some other race, and 3.5% from two or more races. 89.6% of the population were Hispanic or Latino of any race, with 80.2% of Mexican descent. There were 22,101 households, out of which 57.9% had children under the age of 18 living with them, 52.3% were headed by married couples living together, 17.6% had a female householder with no husband present, and 19.7% were non-families. 15.5% of all households were made up of individuals, and 5.5% were someone living alone who was 65 years of age or older. The average household size was 3.79, and the average family size was 4.19. The age distribution at the 2010 census was 33.8% under the age of 18, 11.6% from 18 to 24, 30.9% from 25 to 44, 17.7% from 45 to 64, and 5.9% who were 65 years of age or older. The median age was 27.8 years. For every 100 females, there were 103.7 males. For every 100 females age 18 and over, there were 103.9 males. Of the total population, 50.9% are male and 49.1% are female. As of the 2011 American Community Survey, the median income for a household in the town was $39,557, and the median income for a family was $42,235. Male full-time workers had a median income of $31,603 versus $31,117 for females. The per capita income for the town was $14,339. About 15.6% of families and 18.3% of the population were below the poverty line, including 22.9% of those under age 18 and 16.2% of those age 65 or over. As of 2011, 52.5% of occupied housing units were owned properties, and 47.5% were rentals. There were 4,667 vacant housing units. The average age of home properties was greater than 66 years. The top five non-Hispanic ancestries reported in Cicero as of the 2000 census were Polish (4.7%), Irish (3.7%), German (3.7%), Italian (3.0%) and Czech (2.3%). 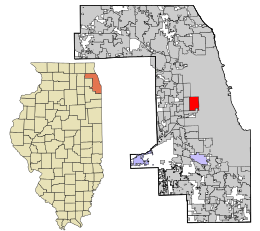 Most of Cicero is in Illinois' 4th congressional district; the area south of the railroad at approximately 33rd Street is in the 3rd district. The United States Postal Service operates the Cicero Post Office at 2440 South Laramie Avenue. Cicero is served by Cicero Elementary School District 99 and comprises 17 schools, making it one of the largest public school districts outside of Chicago. Elementary students attend the following schools, depending on residency: Burnham (K-6), Cicero East (4-6), Cicero West (K-3), Columbus East (4-6), Columbus West (K-6), Drexel (K-6), Goodwin (K-6), Liberty (K-3), Lincoln (K-6), McKinley (K-3), Roosevelt (3-6), Sherlock (currently under construction) (K-3), Warren Park (K-3), Wilson (K-6), Woodbine (K-3), and Unity Junior High (7-8), which is separated into East/West sections. East side being held for eighth graders & seventh graders on the West side. Unity is the second largest middle school in the country. High school students entering their freshman year attend the Freshman Center and then continue high school at Morton East of the J. Sterling Morton High School District 201. From 1927 until 1972, Cicero was the home of Timothy Christian School. Cicero is also home to Morton College. Cicero is served by two major railroad lines, the BNSF Railway and the Belt Line Railroad. Public Transportation is provided by Metra BNSF Railway Line between Aurora and Chicago's Union Station with a stop near Cicero Avenue and 26th Street. Currently, this station is undergoing a much needed reconstruction and expansion by Metra. Also, the CTA Pink Line provides daily service from the 54th/Cermak Terminal to The Loop. Its Cicero station is also located in Cicero. Pace routes 302 Ogden/Stanley, 315 Austin Boulevard, 316 Laramie Avenue, and 322 Cermak Road/22nd Street, and CTA routes 12 Roosevelt, 18 16th/18th, 21 Cermak, 35 31st/35th, 54 Cicero, 54B South Cicero, and 60 Blue Island/26th make up Cicero's bus routes. Cicero is served by the Cicero Fire Department (CFD), with a staff of 68 professional firefighters and 24 paramedics. The CFD operates out of three fire stations. Cicero is mentioned as the hometown of Jimmy McGill/Saul Goodman in the Better Call Saul pilot episode "Uno". JoBe Cerny, actor from Cicero, is the voice of the Pillsbury Doughboy. The American Breed, a rock band known for its hit "Bend Me, Shape Me," originated in Cicero. In the musical Chicago Velma Kelly mentions Cicero as the location of the hotel where she murdered her husband Charlie and sister Veronica. In Walker Percy's novel Love in the Ruins, the schismatic American Catholic church establishes Cicero, Illinois as its "new Rome." In Bertolt Brecht's The Resistible Rise of Arturo Ui, Cicero is annexed by Chicago, as a satirical allegory for the Nazi annexation of Austria. In Guys and Dolls, the Chicago-area gangster "Big Julie" claims to be from "East Cicero, Illinois" (and pronounces the final "s" on Illinois). 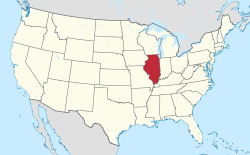 ^ "Cicero (town), Illinois". State & County QuickFacts. U.S. Census Bureau. 8 July 2014. Retrieved 17 September 2014. ^ Illinois Regional Archives Depository System. "Name Index to Illinois Local Governments". Illinois State Archives. Illinois Secretary of State. Retrieved May 2, 2013. ^ a b c d e "Profile of General Population and Housing Characteristics: 2010 Demographic Profile Data (DP-1): Cicero town, Illinois". U.S. Census Bureau, American Factfinder. Retrieved February 14, 2013. ^ "Annual Estimates of the Resident Population for Incorporated Places of 50,000 or More, Ranked by July 1, 2013 Population: April 1, 2010 to July 1, 2013". U.S. Census Bureau, Population Division. May 2014. Retrieved 17 September 2014. ^ "Cicero, IL". Encyclopedia.chicagohistory.org. Retrieved 2012-11-17. ^ Gray, Carroll (2005). "CICERO FLYING FIELD - Origin, Operation, Obscurity and Legacy - 1891 to 1916 - OPERATION, 1911 - THE ESTABLISHMENT OF CICERO FLYING FIELD". lincolnbeachey.com. Carroll F. Gray. Retrieved September 7, 2017. The second great aeronautical event of 1911 around Chicago was the establishment by the A.C.I. of a top-notch flying field named “Cicero Flying Field” (or simply “Cicero”) within the township limits of Cicero (bounded by 16th St., 52nd Ave., 22nd St. and 48th Avenue..At some point during May, the A.C.I. was given a five year lease on the Cicero property by the Grant Land Association, Harold F. McCormick’s property holding company. At the conclusion of the 1911 Aviation Meet, the hangars in Grant Park were moved to the southern edge of the 2-1/2 sq. mi. lot in Cicero. ^ Gray, Carroll (2005). "CICERO FLYING FIELD - Origin, Operation, Obscurity and Legacy - 1891 to 1916 - 1909 & 1910 - GLENN H. CURTISS & THE AERO CLUB OF ILLINOIS". lincolnbeachey.com. Carroll F. Gray. Retrieved September 7, 2017. The day before his two-day exhibition flights at the Hawthorne Race Track in Cicero, Illinois, on October 16 and 17, 1909, Glenn Curtiss spoke to the Chicago Automobile Club and suggested that an aero club be formed in Chicago. In response to his remarks, the Aero Club of Illinois (“A.C.I.”) was incorporated on February 10, 1910, with Octave Chanute as its first president - a perfect choice, to be sure...The second great aeronautical event of 1911 around Chicago was the establishment by the A.C.I. of a top-notch flying field named “Cicero Flying Field” (or simply “Cicero”) within the township limits of Cicero (bounded by [West] 16th St., 52nd Ave [S. Laramie Avenue]., 22nd St [West Cermak Road]. and 48th Ave.), conveniently located adjacent to interurban rail service - just a 15 min. 5¢ trip on the Douglas Park “L” from downtown Chicago, and also was served by two streetcar lines. ^ Gray, Carroll (2005). "CICERO FLYING FIELD - Origin, Operation, Obscurity and Legacy - 1891 to 1916 - 1916 - THE FINAL FLIGHT & A NEW FIELD". lincolnbeachey.com. Carroll F. Gray. Retrieved September 7, 2017. On April 16, 1916, when “Matty” Laird took off from Cicero Flying Field, at the controls of his self-designed and self-built Boneshaker biplane and flew to the new Partridge & Keller aviation field at 87th St. and Pulaski Road, in Chicago, Cicero Flying Field ceased to be. The next day, the Aero Club of Illinois (A.C.I.) officially opened its new 640 acre Ashburn Field on land purchased by A.C.I. President “Pop” Dickinson for the A.C.I.. Ashburn was located at 83rd St. and Cicero Avenue, about 7-1/2 miles almost due south of Cicero. All of the hangars and buildings at Cicero had been moved to Ashburn Field some months earlier. ^ Duechler, Doug (September 5, 2006). "Part II: From Capone to 'Bohemian Wall Street' to, of course, Betty". News. Wednesday Journal of Oak Park and River Forest. Colorful Cicero. Oak Park, Illinois: Wednesday Journal. LCCN sn91055447. OCLC 24273230. Retrieved November 16, 2016. ^ "1951 Race Riots Then & Now - Cicero, IL". Retrieved 2013-05-26. ^ "Chicago Lawn". Encyclopedia.chicagohistory.org. Retrieved 2012-11-17. ^ "American Experience.Eyes on the Prize.The Story of the Movement". PBS. Retrieved 2012-11-17. ^ "Betty Loren-Maltese and fellow perps". Ipsn.org. 2001-06-16. Retrieved 2012-11-17. ^ "G001 - Geographic Identifiers - 2010 Census Summary File 1". United States Census Bureau. Retrieved 2015-08-01. ^ "Historical United States Census Data". Census.gov. Retrieved 2012-11-17. ^ "Selected Economic Characteristics: 2011 American Community Survey 1-Year Estimates (DP03): Cicero town, Illinois". U.S. Census Bureau, American Factfinder. Retrieved February 14, 2013. ^ "Selected Housing Characteristics: 2011 American Community Survey 1-Year Estimates (DP03): Cicero town, Illinois". U.S. Census Bureau, American Factfinder. Retrieved February 14, 2013. ^ Profile of Selected Social Characteristics, Cicero, Illinois. U.S. Census Bureau. Accessed 2007-04-10. ^ "Welcome to The Town of Cicero". Thetownofcicero.com. Retrieved 2012-11-17. ^ "Post Office Location - CICERO Archived 2012-07-20 at Archive.today." United States Postal Service. Retrieved on April 17, 2009. ^ "Welcome To Our Lady of Charity School in Cicero, Illinois". Olc-school.org. 2012-11-13. Retrieved 2012-11-17. ^ "St Frances of Rome School". Sfr-school.org. Retrieved 2012-11-17. ^ Fire Department. Thetownofcicero.com. Retrieved on 2013-07-21. Wikimedia Commons has media related to Cicero, Illinois.